Posts have extremely important roles in rapidly expanding worldwide e-commerce traffic in terms of transportation, logistics and delivery of e-commerce goods with the growth of worldwide e-commerce, as well as taking into consideration of designated operators’ historical mission which is rooted in the eternal presence of Universal Service Obligation that requires Posts to function for everyone everywhere. This little expression “to function for everyone everywhere” summarizes the huge and immortal effect of Postal Services for humanity. 9 October World Postal Day is a product of the spirit of unity among the postal operators which is celebrated every year by the member states of the World Postal Union. We are going through an age in which recent technological advancements will help postal sector to improve their services for connecting people worldwide. From now on, our goal in postal sector must be to work hard to enable all postal shareholders to employ these new technologies efficiently. I am sure we will manage this hard task with the help of the mentioned unity spirit. 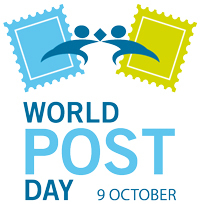 I, as CA Chairman of UPU, wish you all a happy World Postal Day!